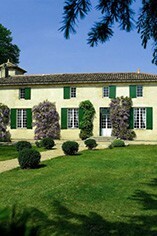 Château Doisy-Védrines,the largest of the Doisy estates and a 2éme Cru Classé Barsac property has been owned by the Castéja family since 1946. The family also own Batailley and Trotte Vieille). Doisy-Védrines's 27 hectares of vineyards are situated on the highest plateau in Barsac and are planted with 80% Sémillon, 15% Sauvignon Blanc and 5% Muscadelle. The grapes are picked in several "tries" and the yields are painfully low, even by Sauternes standards. Fermentation starts in temperature-controlled, stainless steel vats for around a week before the must is transferred to 100% new oak barriques. The wine remains in barrique for 18-20 months. Doisy-Védrines is one of the richest and most full-bodied wines in Barsac and it significantly uses the Sauternes AC rather than the Barsac one. It needs at least 5 years of bottle ageing and the best vintages will keep for up to 25 years. Ch. 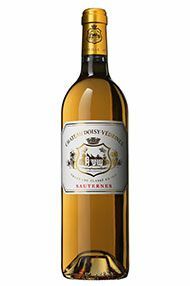 Doisy-Védrines is one on the most consistent wine properties in Sauternes, delivering near-perfect liquid gold year-in, year-out. What I love about this property is the freshness they give to the wines, which makes them approachable very early on, but also builds the backbone for very long-term ageing. 2010 is no exception to this; it is very fresh on the approach with lovely tropical fruits, apricots, and gorgeous long and precise sweet finish. It is in my top three Sauternes this year. One of the stars of the sweet wines this year and seemingly indicative of a strong showing for the commune of Barsac. The bouquet is truly a thing of beauty, with pure, vivid aromas of citrus peel, apricot and honey. The palate is again wonderfully pure and clean, and the length, albeit with lowish acidity, impressive. The sweetness is very clean and not at all cloying. Anybody who has tasted the sensational 1989 Doisy-Védrines will want to snap up the equally good 2007 in an instant. As well as being one of the sweetest wines of the vintage it is exceptionally elegant and well-balanced. The nose is marked by intense, icy-cool tropical citrus while the rich yet fresh palate has wonderfully pure, sweet creamy pineapple fruit, plenty of botrytis and fine balancing acidity. The finish is incredibly long and precise. Made from 95% Sémillon and 5% Sauvignon Blanc, this is a magically sensual Sauternes at an outstanding price. Exceptionally low yields (just 15 hl/ha) have resulted in ripe apricot and honeysuckle flavours with juicy, dried apricot fruit and a glorious, glycerol texture. This is elegant and fine with lovely crisp acidity in perfect balance with the sugar. Just a smidgen off the incredible 2007 perhaps, but a thoroughly fine addition to your cellar all the same.Owner and winemaker Olivier Castéja says that the direction the wind is blowing at harvest is a good indication of the quality of the vintage; if you can hear the train it signifies that the wind is blowing from the west and conditions are likely to be dry, if you can hear the motorway to the east, then bad weather could be on its way. Fortunately in 2008, the only sound to be heard during the harvest was the train clattering along the railway track to the west, and the weather was warm, fine and dry throughout. Exceptionally low yields (just 15 hl/ha) have resulted in ripe apricot and honeysuckle flavours with juicy, dried apricot fruit and a glorious, glycerol texture. This is elegant and fine with lovely crisp acidity in perfect balance with the sugar. Just a smidgen off the incredible 2007 perhaps, but a thoroughly fine addition to your cellar all the same.